A pipeline protest in North Dakota has been growing by the busload and organizers now call it the largest gathering of Native Americans in modern times. It’s estimated that members of 60 tribes have gathered at an encampment overlooking the Cannonball and Missouri Rivers, the Bismarck Tribune reports. More than 150 tribes so far have sent resolutions and letters of support to show solidarity with the Standing Rock Sioux and the Seven Council Fires of the Lakota’s efforts to stop the pipeline. The Yakama Nation, Swinomish Indian Tribal Community, Lummi Nation, Puyallup Tribe, Nisqually Indian Tribe, Suquamish Tribe, Lower Elwha Klallam Tribe and Hoh Tribe traveled with a large delegation from the Pacific Northwest with a sacred totem pole to demonstrate spiritual support. After a blessing at the Standing Rock camp near the river, the totem pole will be permanently raised at the Turtle Lodge on the Sagkeeng First Nation in Manitoba next week. 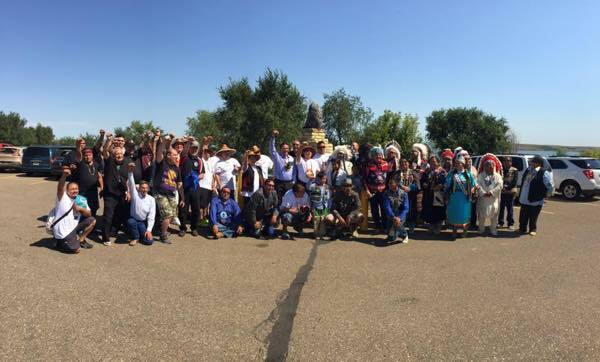 “Yakama is humbled and honored to stand beside our brothers and sisters of the Standing Rock Sioux. We’re observing a peaceful and prayerful gathering to move an entire country. 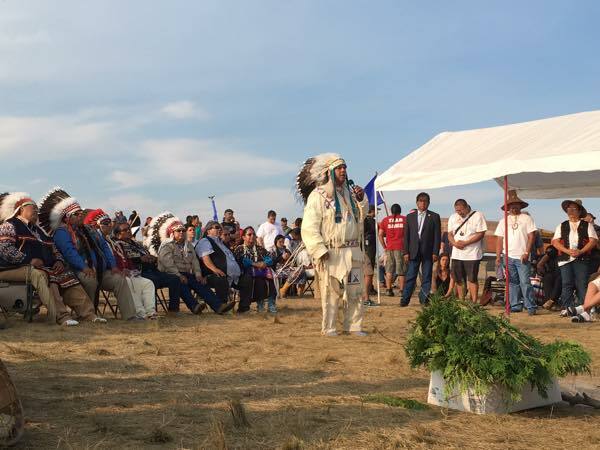 We stand united in solidarity with the natural laws of this land, advocating for responsible decision making and honorable communications,” said Yakama Chairman JoDe Goudy. The peaceful camp near the river is the first time since 1875 that all the Lakota tribes have gathered at the Cannonball River. Their efforts to save their water have inspired hundreds of tribes, celebrities and activists from across the country to show their support. Numerous tribes have written letters to President Obama and the U.S. Army Corps of Engineers asking them to fulfill their trust obligation to tribes and reconsider the construction of the Dakota Access Pipeline. Responses to "Historic Resistance to Dakota Pipeline: Biggest Gathering of Tribes in Years"
Amazing to see this gathering. Just behind then you can sense the attuned spirits of all whose land and water are threatened by these pipelines across this country and all over the world. This is what I call a United Nations! Stand strong. eventually the main stream press is going to have to pay attention. and, social media is buzzing. Very sad that there is so little support for fresh water and environmental protection. I am with you in Spirit. Praying with woman's CHANUPA in Indiana supporting relatives....gram Kitty's brat granddaughter here. Foxsong out!!!! weve lost every battle since we were here first,they had to take our land away from us,take our burial ground and our history in schools aren't even right,guess they forgot about Sandy hook,it should be a Natioal day since Jessie Jackson,who the hell was he compared to us and they give him a holiday,what about all the people of all our nations who have lost the Sandy hook should be a holiday of memeories as we fought fer this country now they want to do this pipeline and we will loose again and look how they are arresting us...we go in peace and they cant deal with it...they will mess our rivers water up and oil will be spilled and then sue the hell out of them! !Me Native and fighting the evil Spirits to go away and let us live our life and ansestors what time we have as they put us on reservations and its our land from beginging ! Americans white men are ignorant to our way of life and to know that they have Indian in their gernation,but still fighting agaist us as they think they so cool be a police officer..whatever..bring their families here to see what we are loosing!They wouldn't understand the trails of tears! Everyone should have the right to clean drinking water. This is nothing more than corporate shareholder greed. My ancestors are not First Nations - nor America. I send you my support from Canada. Great! I send you my support from Czech Republic. Don´t stop! With love, Marie. Our Ancestors had the first contact on this land who are always the divine realms of being. Our Ancestors are reborn through our children, whose spiritual essence travels from Heaven to Earth. Our elders will become Ancestors and we are our Ancestors reborn. Ancestor reverence is a birth right same as much as this land which is our absolute birth right. May the Great spirit protect each of us and our words of praise & reverence to all our ancestors who selflessly sacrificed their life for this nation transforming more abundance power, magnificent unity during this diversity as the balance between wholeness and differences is expressed with firm integrity. My Mind, Heart & Soul are with each of You out there with prayers, love and unspoken tears of care. Blissful Regards. This is what happens when people with an agenda spread false information in order to achieve their desired end results. So sad that the only thing I can see on media is a football player who sat down for a protest. Media covers up nicely again! Stay strong, because many people forget you are not only doing it for you, you are doing it for all people! Water is the most important to feed the world! This is the largest, and most consequential, gathering of the tribes since Tecumseh's Confederacy of 1805-13. I stand in solidarity with you! Thank you for all that you're doing, as everyone is gathered there to protect our waterways! The intensity of love and support from around the world increase as we stand together in unity! Bless you brothers and sisters! Initiatives to Promote the Government to Government Relationship & Improve the Lives of Indigenous Peoples" document published on their site http://www.state.gov/documents/organization/184099.pdf? Did the government consult the tribes surrounding or situated along the pipeline? So sad that people have to fight to defend their rights for clean water. My prayers are with you sisters and brothers. I live in the U.S., but my ancestors are not First Nations. Still, for the past week I have been asking for help from sacred assistance, my ancestors and the ancestors all across the land asking that they hold a space of peace to help you and bring balance back to our world so that greed can no longer hold sway. Wayra Enapay said it better than I could. I honor all that you are doing….for protecting the water and your heritage; and for holding the sacred space that is also changing the world. Can't we sign a petition to stop this. We all did, several times, to stop Arctic drilling by Shell....I will be more than happy to share a petition and I bet millions will sign from allover the world! We the Maori Nation of Aotearoa / New Zealand STAND IN SUPPORT!! From Australia, strong support. Priorities need to change - taking care of clean water & the environment is the only way to survive and move forward. Stand for the truth. This is a vision I saw this morning on the pipe line protest in North Dakota with all the American Indian’s coming together as one to bring about change. I saw this while on my meditation walk at the Dallas Arboretum. I saw a very futuristic school room that almost seemed like it was in a revolving space station. The question was…..what was the most significant event that changed the way our Earth was managed? How many days encampment did it take to bring about this change? What was the new technology that came about because of this protest? The one answer I heard was a new type of condition was set up. It could no longer be OK to carry heavy insurance for a pretty certain spill but it had to be technology that would instantly stop a spill. I saw a pipe line within a pipeline that had a containment system and instant shut down systems. They were placed in many places along the pipeline. The most important thing I saw was that it was a turning point for the cleanup of our mother Earth. After that more guidelines were set in place that made damage to our mother Earth in any way an absolute non-condition. We eventually had another power source but that was the change that was the pivotal point in our history and was being reviewed centuries later in classrooms.